As your cat gets older it becomes leΒ active and this is especially so in cats over 12 years old. The reduced activity can lead to weight loΒ and a weakening of the muscles. There might also be appetite loΒ because of dental problems and a reduced sense of smell. Your elderly cat may miΒ out on the important nutrients and vitamins it needs to grow old gracefully. This can cause its fur to become dull and thin, and it might suffer from sleeping and behavioural problems. A healthy nutrition, specifically directed at older cats can help your cat to lead a happy healthy life in its later years. Old age can also affect renal performance, the joints, the immune system and the digestive tract. 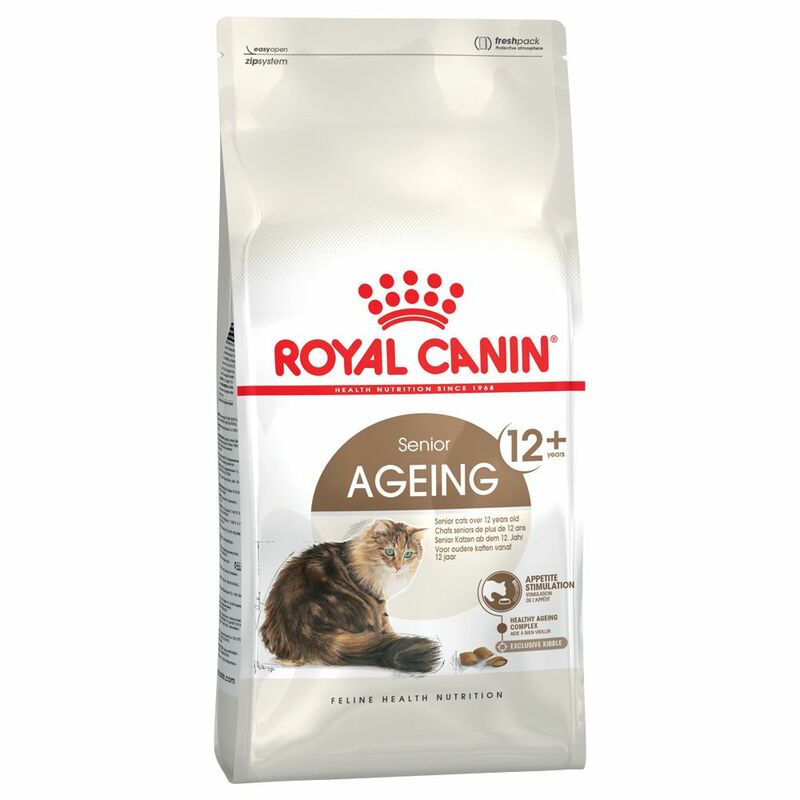 Royal Canin Ageing plus12 cat food contains everything your cat of 12 years or more needs to stay healthy: Reduced stool odour : The natural ingredients in Royal Canin Ageing plus12 cat food minimise the amount of undigested food and encourages gut flora. Nasty stool odours are reduced naturally Healthy Ageing Complex for slower cell ageing: Rich in vitamin E and C, which together with polyphenoles from grapes and green tea neutralise free radicals and slow down the cell ageing proceΒ, and helping your cat to stay lively Reduced phosphorus and sodium content helps maintain kidney function Optimum calorie content: appropriate for the leΒ active lifestyle of indoors cats Special kibble shape: Soft inside and crunchy on the outside to encourage your cat to chew Improved dental hygiene: With sodium polyphosphates which bind the calcium in the mouth and prevents tartar build-up Balanced mineral content: for a healthy urinary tract with optimum pH-levels in the urine (pH 6-6. 5) Gentle elimination of swallowed hair: This clinically tested formula activates the digestive tract and helps to gently get rid of hair which your cat has swallowed, thereby reducing the risk of hairballs forming Beautiful shiny fur: The high protein content and valuable nutrients and fatty acids support shiny healthy fur For more than 40 years Royal Canin has made your pet's health the prime focus of their work. This has led to the product range "Health Nutrition" amongst others. Only with the knowledge of your pet's exact nutritional requirements and with respect for the individuality of every animal can the perfect meal be developed and produced to exactly meet your pet's needs. Kibble:.